It’s those damn teachers. At least, that’s the crusty old complaint revived for the Fourth of July holiday by crusty conservative commentator Charles Krauthammer. Whether you’re a flag-waver or a flag-burner, there are two big problems with Krauthammer’s sorts of accusations. Krauthammer was responding to a Fox News poll that says only a bare majority of Americans are proud of America. And a huge majority think the Founding Fathers would be saddened by the way things are today. the counter-cultural left had a strategy…[they] went into the professions – the teaching professions, and they’ve essentially taken over. That generation of radicals runs the universities, they run the teachers’ unions, they run the curricula. The left-wing teachers, Krauthammer insisted, had taught defenseless kids “abnormal, anti-American, and destructive” ideas. Since the 1960s, Krauthammer explained, the Left’s long game had undermined American patriotism. Can you spot the two blunders…? Let’s put to one side the most obvious problem with Krauthammer’s Fox-usations. The Fox poll found—surprise!—that Democrats tended to be less proud of the current state of the county. Well…duh. Of course a majority of Democrats are not “proud” of the current state of the United States. Of course a lot of Americans are feeling sketchy about the current direction of America’s leadership. And, to be fair, that is the first place Krauthammer looked. He started by saying that people’s feelings about Trump are the most likely culprit for the poll results. But then he goes on to make two common assumptions that drive teachers and historians bonkers. First, he inflated the power of schools and teachers. He related a story of his own family’s school. He had to protest, he said, to get his children’s school to teach any European history at all. Left to their own devices, the teachers would have utterly ignored anything European in their fervent quest to teach children about the rest of the world. Ask any teacher, though, and they’ll tell you how it really is: Kids’ politics are shaped by their families and friends, not by their forty-five minute social-studies lessons. All of us who try to teach US History have had experiences similar to the one related by Stanford’s Sam Wineburg. Wineburg studied a history teacher who tried to teach his class about the Vietnam War. To his chagrin, he found that his high-school students had already made up their minds about it. For some students, the moral quandaries of the war had been settled at home around the dinner table, long before the school bell rang. Moreover, Krauthammer repeats the wrong-headed assumption made by pundits both left and right. He assumes that the tension over patriotism and schooling began in the 1960s. As I argued in my book about the history of educational conservatism, Krauthammer’s jeremiad about leftist teachers could have come from almost any decade. Conservatives have ALWAYS assumed that left-wing teachers had taken over the schools. There’s nothing “Sixties” about it. If you switched the dates around, in fact, it would be difficult to tell them apart, whether they came from the 1930s, the 1960s, or today. Consider the punditry of B. C. “Bertie” Forbes. Forbes built up his business journalism into the magazine that bears his name. Long before Fox News, long before the “Sixties,” Forbes was out-Krauthammering Krauthammer with his accusations against sneaky left-wing infiltration of the teaching professions. I would be converted by reading these Rugg books to the belief that our whole American system, our whole American form of government, is wrong, that the framers of our Constitution were mostly a bunch of selfish mercenaries, that private enterprise should be abolished, and that we should set up Communistic Russia as our model. want their children taught such ideas? Do they want them to be inculcated with the idea that the United States is a second-rate country, that its form of government is open to question, that there are other countries more happily circumstanced and governed than ours? For Forbes in 1939, just as much for Krauthammer today, the danger was real and immediate. Leftist teachers hoped to warp the minds of their pupils with their anti-American ideas. So, SAGLRROILYBYGTH, let’s keep two things in mind as we celebrate the Fourth of July. First, whatever pundits might say, teachers and schools don’t have the power to dictate patriotism. Even if they wanted to—and they have wanted to!—schools couldn’t cram pro- or anti-American feelings down kids’ throats. In the end, schools only have a smallish influence on what people really think. Second, if you share Krauthammer’s pessimism about schools today, don’t share his short-sighted historical blunders. We can’t blame or praise the “Sixties” as the roots of today’s culture wars. The Sixties were just another round of a conflict that had started long before. Posted in Freedom & the Free Market, From the Archives, What is school? Why Don’t Conservatives Like to Win? You’ve heard the news by now: The College Board revised its framework for the Advanced Placement US History course. Recently in the pages of the Wall Street Journal, Daniel Henninger crowed that this reversal proved that conservatives could influence national education policy. Unfortunately, Henninger makes the same mistake as every other pundit out there. He seems to think that conservatives at some point in the past lost their influence over national education policy. It just ain’t so. such abstractions as ‘identity,’ ‘peopling,’ ‘work, exchange, and technology,’ and ‘human geography’ while downplaying essential subjects, such as the sources, meaning, and development of America’s ideas and political institutions. . .
being rolled completely off the table by institutions—‘Washington,’ the courts, a College Board—over which [conservatives] had no apparent control. Until now, Henninger tells us, conservatives had not been able to influence national education policy. Only “neo-Marxist” experts decided on what vulnerable young minds would learn. Perhaps Henninger’s problem is his limited range. To be fair, he only says that this has been the case since 1992. As SAGLRROILYBYGTH are well aware, America’s educational culture wars have a vital history that stretches back across the twentieth century. Henninger ignores it at his peril. 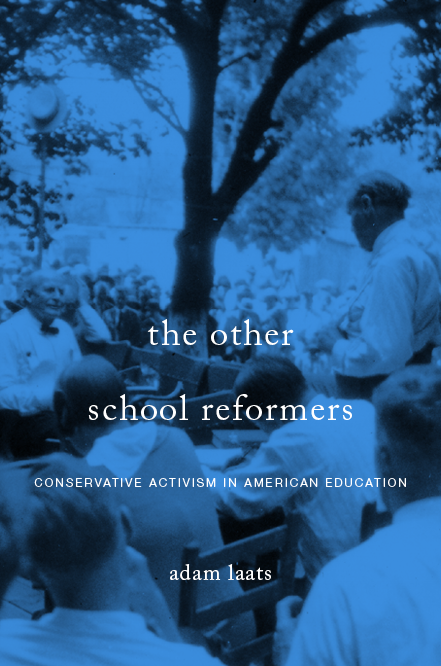 As I argue and detail in my recent book, since the 1920s conservative activists have been able, time and time again, to derail, defang, and water down progressive curricula and textbooks. But here’s the real kicker: We can’t really single out Henninger for short-sightedness. For almost a century now, both progressive and conservative intellectuals and activists have assumed that conservatives had been kicked out of the conversation. You read that right. Ever since the 1920s, conservative and progressive reformers alike have committed the same sort of Henningerism. They have assumed in the face of historical fact that “The Schools” had been taken over by progressive ideas and curricula. To cite just one example of this trend, consider the case of progressive textbook impresario Harold Rugg. Rugg was a progressive’s progressive, committed to pushing the nation in leftist directions by seizing control of its public schools. They succeeded. Just like today’s College Board, school administrators and textbook publishers in the 1930s fled in horror from the potential controversy over Rugg’s books. Sales plummeted. Schools hid them away. School boards thought about burning them. Seems like any right-thinking observer would conclude that conservative activists could exert significant control over the national curriculum, right? has already begun to shake the old and inadequate out of our educational system and to lead to the building of a new school to implement democracy. Nothing save a major cultural catastrophe can now stop its progressive advance. It was utterly inevitable that workers in education would find the vast library of documented data produced on the other frontiers and use it in the systematic reconstruction of the schools. We could multiply these examples of Henningerism endlessly. Time and time again, long before 1992, conservatives have concluded incorrectly that they had been kicked out of the schools. And progressives gleefully agreed. It brings us to our interesting question: Why do conservatives and progressives agree—in the face of vast reams of historical evidence to the contrary—that conservatives are have been locked out of national education policy-making?